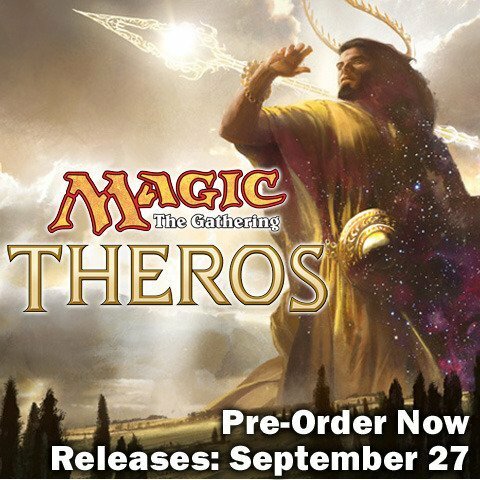 Theros is the epic new expansion for Magic: The Gathering! Theros is the first set in the newest Magic: The Gathering block and also a brand new plane in the Magic Multiverse. The setting is inspired by Greek mythology, a theme that longtime fans have always asked to see interpreted by the award-winning worldbuilders and designers of Magic. The plane of Theros is ruled by a pantheon of all-powerful gods. Krakens, minotaurs, and other monsters threaten the safety of walled cities. Heroes rise to battle, bolstered by their devotion to the gods. The set tells the story of Theros with new cards that include: legendary god creatures, powerful enchantments, and brand new Planeswalkers.